The female reproductive system is not unlike that of the male in gross morphology, consisting of longitudinal and transverse tubules. These tubules lie between the third and sixth or seventh mesosomal (body) segment and ventrally to the alimentary canal. The longitudinal ovarian tubes are either three or four in number, if three this results from fusion of the median tubes. Longitudinal tubes are connected by either four or five transverse ovarian tubes, resulting in a reticular network. The lateral ovarian longitudinal tubes proceed anteriorly forming the dilated seminal receptacles (spermathecae), which then open into an expanded genital chamber (vaginal part). The genital chamber opens to the exterior via the gonophore (genital aperture), which is located at the first mesosomal segment. The gonophore is covered externally by the flap-like genital operculum. The reticular ovarian tubes are functionally both ovaries and oviducts and are referred to as ovariuterine tubules where both fertilisation and embryonic development takes place. The inner wall of the ovariuterus has a germinal epithelium layer that gives rise to the oocytes. Oocytes grow outward from the ovariuterus, and in the early stages are not apparent. As development continues the oocyte appears as an outward bulge of the ovariuterus, surrounded by trophic follicle cells. The enlarging oocyte remains as a protuberance of the outer ovariuterine wall, whilst maintaining an opening to the lumen of the ovariuterus, presumably to allow passage and uptake of sperm. From this point on there are two major forms of further development in scorpions. In one group of scorpions the fertilised ovum passes back into the lumen of the ovariuterus where it continues and completes development right up to parturition. Families showing this development are the Buthidae, Bothriuridae, Chactidae, Iuridae and Vaejovidae. Cells in the ovariuterine wall transfer nutrients into the lumen where they are absorbed by the integument of the embryo. This form of development was termed by Laurie (1886) as "apoikogenic", meaning "away from home", in consideration of the change from early development. In the families, Diplocentridae, Ischnuridae, Scorpionidae and Urodacidae the fertilised ovum remains within the protuberance of the ovariuterine wall, which becomes known as a diverticulum. As the embryo develops and increases in size a specialised feeding structure forms that transfers nutrients from the maternal haemolymph to the mouth of the developing embryo. This type of development was termed by Laurie (1896) as "katoikogenic", meaning, "at home". Apoikogenic development is thought to be primitive due to its close similarity to the development characteristics of ancestral aquatic chelicerates and is less complex than that of the katoikogenic plan. The katoikogenic plan shows similarities with other primitive chelicerates, but also shows specialised ovariuterine structures (diverticulum, appendix). In addition to this the anterior appendages, mouth, and digestive tract differentiate early, enabling the embryos to ingest maternal nutrients. This is in contrast to apoikogenic development where mouth and digestive tract develop late, suggesting absorption of nutrients by surrounding membranes and embryonic integument in early embryos. Scorpions show comparatively long gestation periods, similar or greater than those shown by many mammals. Scorpions in temperate regions tend to give birth seasonally from spring to late summer. Tropical species often show no preferred or seasonal birthing period. Buthids have the shortest gestation periods of 3-7 months, whereas other groups such as the scorpionids have gestation periods of 12-18 months. Temperate species often show synchrony with birthing, even in species where mating is not synchronised. Because scorpions are ectotherms, embryonic development is arrested during cold periods and accelerated with the onset of warm weather. In Australia the Urodacus genus often mate in spring and have their young at the end of the next summer, i.e., approximately 18 months gestation. It would appear as though development during the first warm period after mating is not long enough to complete embryonic development. Urodacus elongatus kept in captivity (personal observation), allowed to mate artificially early in very early spring have shortened gestation periods, giving birth by the end of the following summer. This 8-month gestation period is a reflection of the artificially high temperatures of captive conditions and the early mating, allowing full development in a shorter period of time to that observed in the wild. Although this period is probably borderline as only one out of three pregnant females had young which survived after birth. Parturition in Urodacus elongatus (personal observation) is most likely triggered by environmental factors such as dropping temperatures and increasing humidity. This observation came about by synchronised birthing at a point in time when temperatures were dropping and humidity was on the increase, due to comparatively warm days and cold mornings. This captive observation correlates with that seen in the wild, where many juvenile scorpions are first seen in autumn. Just before birthing begins the female scorpion assumes the birthing position, whereby she arches her body off the ground and forms the birth basket with her front two pairs of legs. 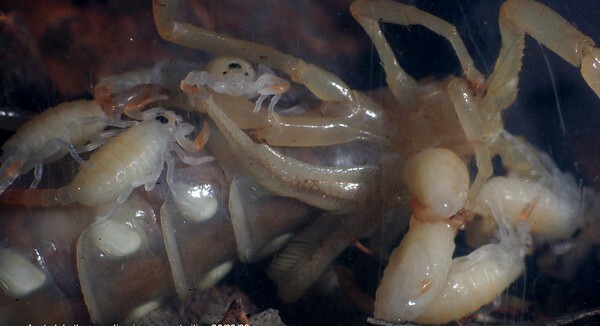 One scorpion is born at a time and gradually they accumulate under her body (see inset image). As the bundle of young accumulates some begin to make their way onto their mother's back. Parturition was observed to be complete after about two hours in Urodacus elongatus, with all the young making their way to mother's dorsum in two more hours. Female scorpions display a degree of maternal care for their offspring. Young scorpions ride on their mother's back until some time after they first moult into second instars, which is variable for different species. In Buthids this may only be a few days, whereas in Scorpionids (Urodacidae) this may take four weeks or more. During this vulnerable time young scorpions gain protection from potential predators. Recent preliminary studies have suggested young scorpions on mothers back may derive other necessary benefits from this maternal/young aggregation. Laboratory studies have shown that larvae disassociated from the mother have a lower survival rate than those which remain on the mother's back. Predation was clearly not a factor in these studies, and its role relative to larval survival in natural environments has yet to be reported. Laboratory observations have suggested that young take water up from the mothers cuticle and possibly the close contact aggregation of the offspring and mother allows water transfer across adjacent membranes by diffusion. This hypothesis seems even more likely when one considers that first instar Urodacus elongatus are born without spiracle openings to their book lungs, making diffusion through the membrane-like cuticle the most likely vehicle for respiration. 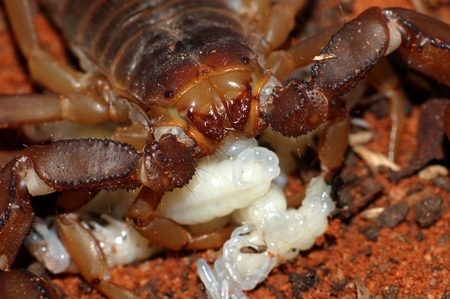 Young scorpions generally do not feed whilst on the mother's back, although some observations have been made of young feeding on food items left over by the mother. Young scorpions when born are quite large in comparison to their post first moult size. Pre-moult feeding while with the mother comes from internal food reserves with which they are born. Many first instar scorpions do not have chelicerae specialised enough for their own feeding so relying on internal nutrients is essential. Once young leave the mother (post first moult), they do not return to her and continue their own independent existence.